I have baked my family’s bread for four decades. For the first few years after I began to bake the family bread, my breadmaking was largely exploration. I tried many different bread recipes. Some of the breads succeeded, a few didn’t. I was having fun with my experiments, but I was also training my family to look with suspicion on my breadmaking efforts. They stopped including my bread in their food plans, with the result that, even when my bread succeeded, most of it sat on the counter until it was too stale or too moldy to eat. Such was the state of affairs until we moved to Virginia in 1975. A friend there, Jerry Lapp, taught me how to bake an oatmeal-wheat bread. I learned from Jerry, who is as persistent as I am distractable, that baking bread was a habit, not a performance. I modified his recipe little by little until I had something that satisfied the bread eaters in my household, then I started to make it, week in and week out, year in and year out. Eventually I reconditioned my family began to notice steadier ways. My bread began not only to be eaten, but to be anticipated. I found that, by freezing the loaves as soon as they had cooled, a typical baking of four or five loaves gave us fresh bread for about two weeks. A little math suggests that I have baked this bread well over six hundred times. The actual length of my intense labor in making this bread is hardly more than twenty minutes, but with rising and baking time the whole process consumes about two and a half hours from start to finish. All of the mistakes that could be made with a single recipe I have made at one time or another. I have made it too gooey, I have made it too dry. I have underbaked and overbaked it. I have killed the yeast by adding it to a dough that was too hot. I have left out the salt. These days, however, though the bread varies a little in quality from one baking to the next, it rarely fails. If you wish to print this recipe, here is a pdf version. Soak two cups of oatmeal in four cups of boiling water. I generally use quick oats, but traditional rolled oats are fine as long as you get them soft — cooking them at a simmer for ten minutes would probably help. When the mixture has cooled to lukewarm (under 115 degrees Fahrenheit) you can add the yeast. I use about 1 or 2 tablespoons of instant dry yeast. But take care that the whole mixture has really cooled before adding the yeast. The ability of a mass of oats to retain heat is truly phenomenal—it is easy to damage or destroy the yeast ferment by adding it too early. I usually start the yeast in a cup or two of warm water mixed with a teaspoon of sugar about ten minutes before I add it. Blend all of this well and start adding dry ingredients. You can add up to 50% whole wheat flour, but I’ve gradually decreased the whole wheat content over the years and upped the amount of bran and wheat germ. I use only white flour (unbleached, of course) in most batches. Keep working in the flour and other ingredients until you have something that looks like it could be kneaded. You should be able to get in about ten or eleven cups of flour, but the humidity, altitude and condition of the flour all affect the amount of flour needed. After you turn the dough from the pan, knead it for at least five minutes, the more the better. Let it rise to double size, then punch it down and put it in bread pans. Let it rise in the bread pans about 20-30 minutes. I have found that if you use good bread tins, grease them moderately before each use, and store them in the freezer between loaves, it isn’t necessary to wash them. Before I put the pans in the oven, I use a boxcutter knife to make a lengthwise cut along the middle of the loaf. This helps to keep the top of the loaf from lifting off the sides. Then I spray the tops with water and sprinkle on sesame seeds. Bake at 300 degrees Fahrenheit for about 55 minutes, or 350 for less. Too little cooking and the added oat bulk will keep the loaf pasty, too much and the bottom burns. When it is done perfectly, the loaf will look a little too moist if you cut it while it is still hot, but it will be just right after it cools. This bread freezes well. After the bread has cooled I put everything which we are not going to use in the next two days in the freezer. I live in the Pacific Nothwest. 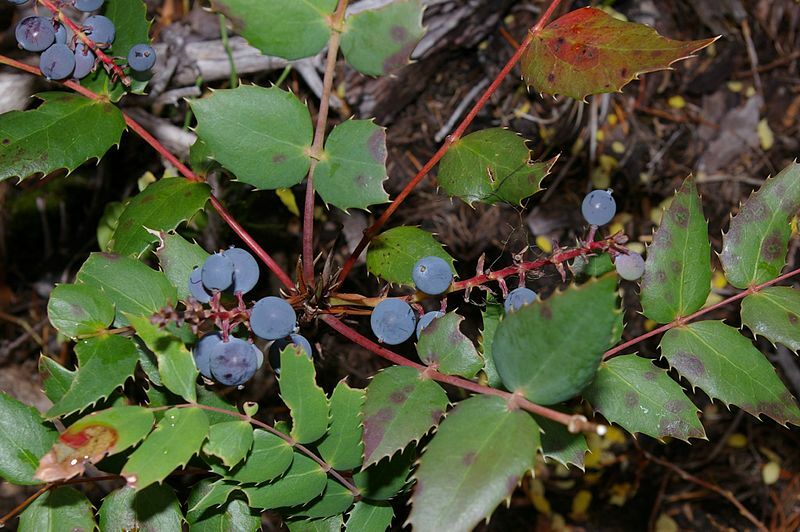 A common native plant, Oregon grape (Mahonia aquifolia and Mahonia nervosa), is found in and around local forests. The plant’s yellow flowers produce clusters of small, purple fruit. These berries have the taste of a really sour grape. They can be used to make a jam or jelly, if you add enough sugar. The step-by-step process, with picturez, can be found here.